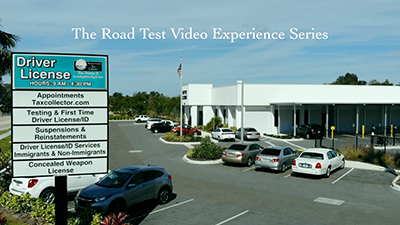 Bradenton FL – The Manatee County Tax Collector's "The Road Test Experience" video series has been well-received; in the first eight months, there have been nearly 1,300 views. The videos help prepare Manatee County residents for their driving skills road test by providing information about the vehicle inspection, vehicle maneuvers, and a sample road test. Each video includes 'key points to remember' and can be viewed at http://www.taxcollector.com/dl-videos.cfm on a mobile device, tablet or computer. "We are pleased with the viewership of these informative videos my staff created," said Tax Collector Ken Burton, Jr. "Our customers spend an average of 10 minutes watching the videos before they come in, and tell us they are clear, concise, and helpful." "We have achieved our two main goals in making the videos" said Michele Schulz, Director, Field Services and Collections. "First, to provide an additional resource customers can use when preparing for their road test; and second, to reduce their anxiety. It's been a win/win." For more driving test information, The Florida Driver’s Handbook (in English, Spanish and Creole) is available at www.flhsmv.gov/resources/handbooks-manuals along with the Driving Skills Road Test publication at http://www.taxcollector.com/dl-geninfo.cfm. Manatee County residents can schedule an appointment at https://booknow.appointment-plus.com/7b4y9bem/.